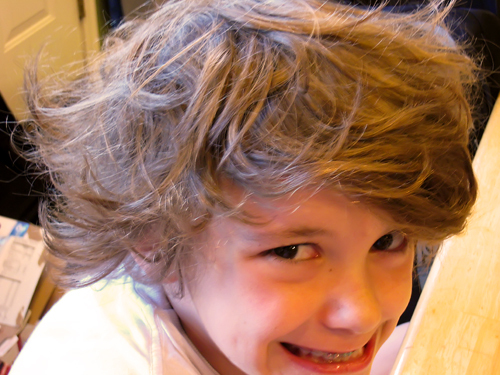 His hair has actually been **much** worse than this in the mornings, but I don’t think I will ever get a picture of it. I took these pics yesterday at breakfast. 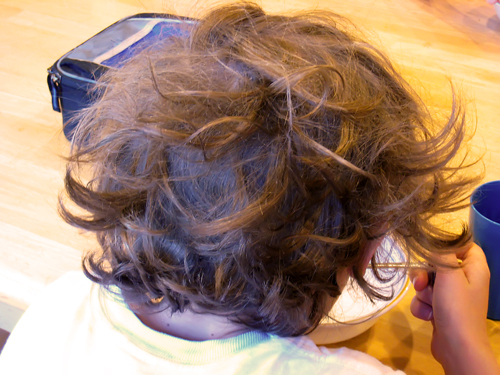 *This* morning, he wet and combed his hair before even coming down the stairs. LOL! My productivity from the other day has disappeared. After picking Tyler up today, I hit a brick wall (figuratively). I’m still not out of my funk, but Top Chef is taking my mind off of it. I’m off to see who gets eliminated (or illuminated as Tyler and Avery would say…lol). LOL…Lisa’s comment made this post even funnier and I didn’t think it was possible. Just catching up on a few posts after a busy week…love, love, love the tulip pics.